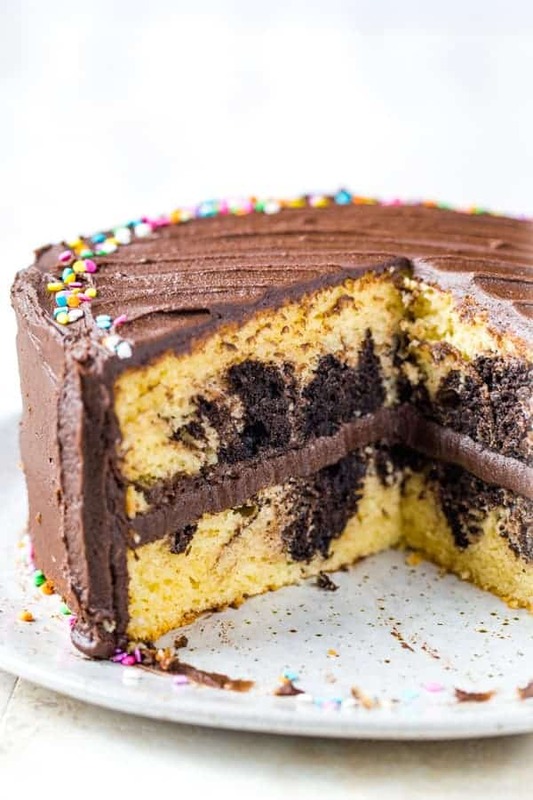 This gluten-free marble cake recipe is perfect for those times when you can’t decide between chocolate or vanilla cake. Great for birthday parties and other celebrations. Is it just me or has marble cake fallen a bit out of fashion? 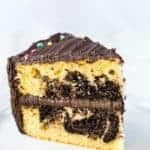 While working on this recipe, I noticed that there were no marble cake mixes sold in the baking aisle of the supermarket. And I don’t mean gluten-free cake mixes. There were no marble cake mixes at all. 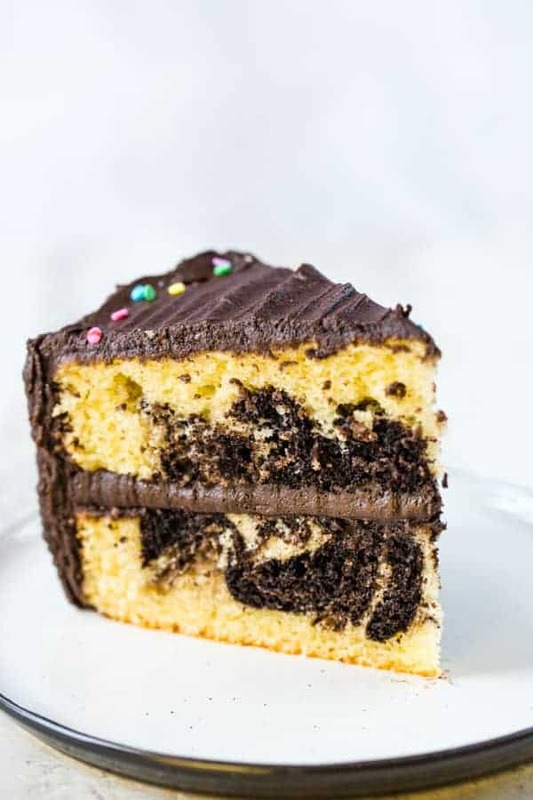 Marble cake needs to stage a comeback. 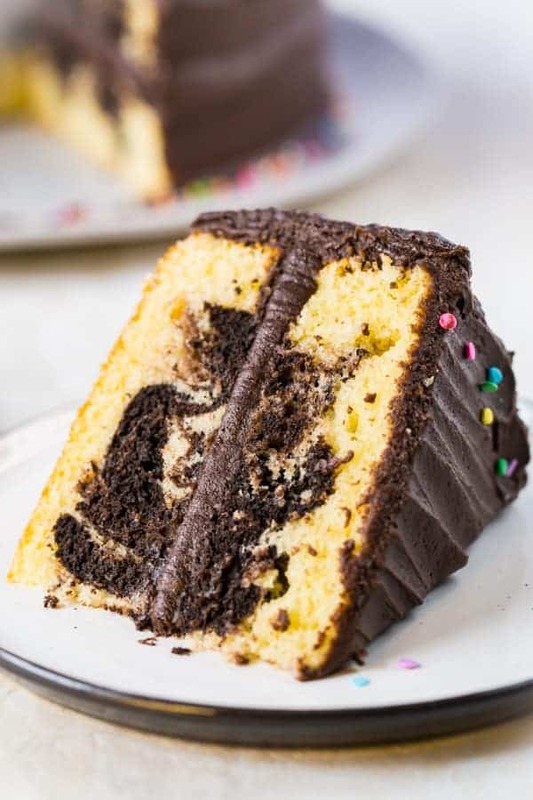 Traditionally marble cake is yellow cake with swirls of chocolate throughout. 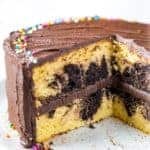 However, you can make a colorful marble cake by swirling colored batter through yellow cake for baby showers or birthday parties. 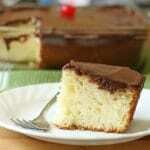 How Do You Make Gluten-Free Marble Cake? First make the yellow cake batter. It’s a simple one-bowl cake recipe. Then scoop out about one cup of cake batter. Stir in some dutch-process cocoa powder to the one cup of batter. I like to use Dutch process cocoa powder because of it’s rich flavor. If you can’t find it, don’t worry. Natural cocoa powder may be used. Drop chocolate batter haphazardly over the top of the batter and drag a knife gently through the batter to combine. Since cocoa powder was added to the chocolate batter, you’ll notice it’s a bit thicker than the yellow batter. 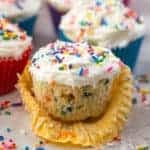 Can This Recipe Make Marble Cupcakes? Yes! Spoon yellow batter into paper-lined cupcake pans. Then drop a tablespoon of chocolate batter into each cup. Mix with a toothpick to swirl batter. What’s the Best Gluten-Free Flour for Marble Cake? I tested this recipe with Bob’s Red Mill 1:1 Gluten-Free Baking Flour. Any grain-based gluten-free flour blend that contains xanthan gum should work. Please note: a paleo or grain-free blend won’t work with this recipe. 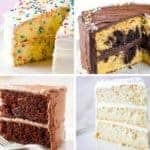 Can I Use This Recipe for a Sheet Cake? Yes! Grease a 13 by 9-inch pan. Spread yellow batter into the pan. Drop chocolate batter over the top. Drag a knife through the batter to combine. Bake until a cake tester inserted into the center of the cake comes out clean, about about 30 minutes. What Kind of Frosting Should I Use for Marble Cake? It’s up to you! For some reason, I love chocolate frosting on a marble cake. I’ve included a recipe for chocolate frosting below. 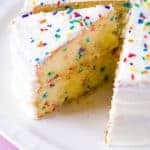 My gluten-free vanilla buttercream frosting recipe also goes great on this cake. And, if you can’t decide, you could make a half batch of each frosting and swirl it onto the cake. Best of both worlds! Can I Use a Gluten-Free Cake Mix? Sure, why not? Be sure to use a mix that makes two 8-inch layers or reduce the amount of batter and cocoa powder by half. Mix batter according to package directions. Remove one cup batter and stir in 1/4 cup cocoa powder. At the time of publication, all food items listed are gluten-free. Ingredients change. Always check products for the most accurate labeling. Adjust oven rack to center position. Grease two 8-inch round cake pans with gluten-free nonstick cooking spray. Preheat oven to 350 degrees F.
Whisk together gluten-free flour, sugar, baking powder, and salt in a large bowl. Add oil, milk, eggs, and vanilla extract. Using a handheld mixer, blend until smooth. Remove about 1 cup of batter and place into a medium bowl. Divide remaining batter between the two prepared pans. Add the sifted cocoa powder to the 1 cup of reserved cake batter. Whisk until smooth. Drop chocolate batter over the top of the yellow batter. Divide batter equally between the two pans but don’t worry if one pan has a little more chocolate batter than the other. Using a knife, swirl the batters together gently. Don’t overmix. Bake until a cake tester inserted into the center of the cake comes out clean, about 22-27 minutes. Remove pans from oven. Allow cakes to cool in the pan for ten minutes and then turn out onto a wire rack to cool completely. Prepare chocolate frosting. Fill and frost the cake. Whisk together powdered sugar, cocoa powder, and salt in a small bowl. Beat butter for 30 seconds on high speed until light. Stop mixer. Add powdered sugar mix and milk or coffee. Mix, on low speed, until creamy. If frosting seems dry, add additional milk or coffee until smooth and creamy. This recipe was tested with Bob's Red Mill 1:1 Gluten-Free Flour Blend. Replacing the flour with another brand might change the texture of the cake. Be sure to use a flour blend that contains xanthan gum. If it doesn't, add 1 teaspoon of xanthan gum to the flour. Whisk to combine. Then use as directed. Line two 12-cavity muffin pans with paper liners. Prepare batters as directed. Drop about 1 tablespoon of vanilla batter into each cupcake cup. Add a tablespoon chocolate batter. Repeat until the cupcake cup is filled about 2/3 full. Swirl the batters together using a toothpick. Bake until a toothpick inserted in the center comes out clean, about 20 minutes. Grease a 13 by9-inch sheet pan with nonstick cooking spray. Prepare batters as directed. Spread about three-quarters of the vanilla batter into prepared pan. Drop chocolate batter evenly over plain batter. Spoon remaining vanilla batter on top. Swirl batters together gently with knife or spatula for marbled effect. Bake until cake tester inserted into the center of the cake comes out clean, about 30 minutes. Coffee enhances the flavor of chocolate frosting. If you like coffee, use it in the frosting recipe. You won't really taste it but the frosting will have a deeper chocolate flavor.